"Highly rated by users for its ease of use and precise temperature control." "Has an affordable price tag, sleek look, and easy-to-read display." "Allows you to create seven different schedules, each with four periods per day." "It’s compatible with Amazon Alexa and Google Assistant too." "A no-frills product that works with conventional two-stage heating systems." "Doesn’t have any complicated features and won’t collect data on you." "Can be programmed and controlled through a smartphone." "Reviewers say it’s simple and effective for single-stage heating." "Compatible with electric baseboards, convectors, and more." Nest’s “smart” thermostats are widely regarded as one of the best options you can buy. 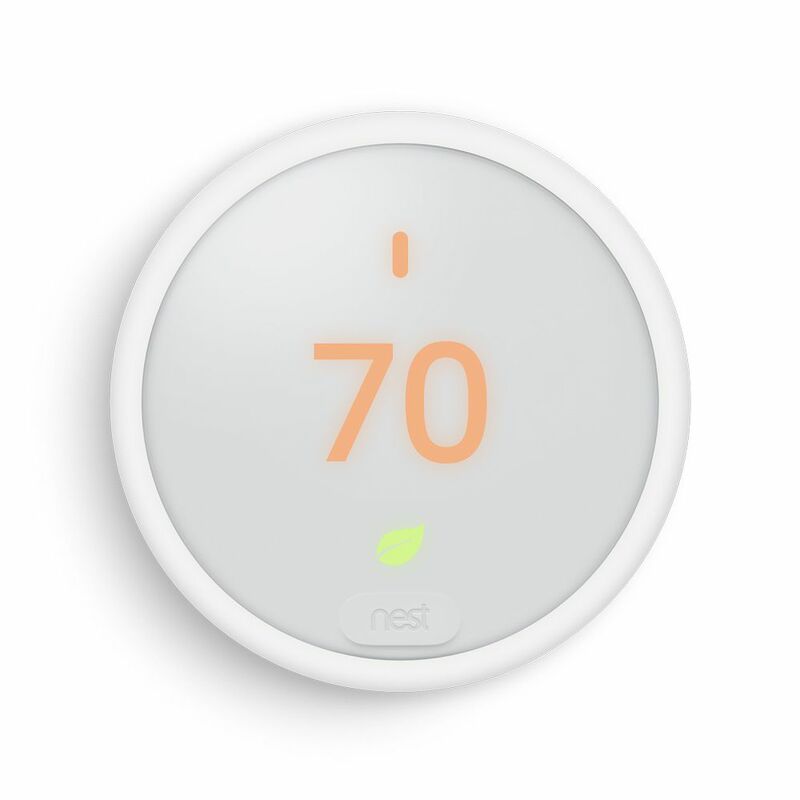 The newest model, the Nest Thermostat E Smart Wi-Fi Programmable Thermostat, is highly rated by users thanks to its ease of use and precise temperature control, and it’s significantly cheaper than the original Nest Learning Thermostat. What’s great about this thermostat is you don’t even have to go through the process of programming it—the gadget automatically learns your habits and creates a schedule to match. It turns itself down when you leave the house and then cranks the temperature back up when you come home. Plus, you can always adjust the thermostat from your phone or alter the schedule to better suit your needs. You can even use the app to monitor how much energy you use! Reviewers write that the Nest Thermostat E is extremely helpful, especially if you have a busy schedule. Several also note it’s useful to be able to control the thermostat remotely, in case you’re coming home early and want to be welcomed by a warm house. You don’t have to spend a lot of money to get a quality programmable thermostat. The Orbit Clear Comfort Programmable Thermostat is a reviewer favorite thanks to its sleek look and easy-to-read display, and it’s under $50—what more could you ask for? This thermostat works with a wide variety of standard heating and cooling systems. It has a large, easy-to-read LCD screen, and you can create a seven-day program to match your schedule, with up to four unique periods per day. It includes a copy feature so you can easily program several days the same, and the product even comes pre-programmed with Energy Star settings that will help you save money! Reviewers say this programmable thermostat is easy to install and set up, and many like the simple design and large-print display. If you’re willing to spend a little more on a thermostat, you can’t go wrong with the highly rated Emerson UP310 Premium 7 Day Programmable Thermostat, which is made by a trusted brand. This product works with a variety of heating systems, and the company claims it can be installed in 15 minutes. The Emerson Premium 7-Day Programmable Thermostat allows you to create seven different schedules, each with four periods per day. The product comes with an “Easy DIY Install Wizard” that will help you install the thermostat in as little as 15 minutes, even if you’ve never done it before. Plus, the thermostat features a backlit screen, auto changeover from heat to cooling, filter change reminders, and keypad lockout. Reviewers say it is quite easy to install and program, and many say it’s a good option for the price. Make your home feel super modern with a touchscreen thermostat like the Sensi Touch. This smart thermostat comes with a host of features that make it a convenient addition to any home. The Sensi Touch Wi-Fi Thermostat features a touchscreen display that makes it easy to adjust the temperature in your home, but you can also create a flexible seven-day schedule for it from your smartphone. Plus, it’s compatible with Amazon Alexa and Google Assistant, so you can even use voice commands to change the temperature! The Sensi Touch works with most HVAC systems and requires a c-wire for installation, and the company says it takes about 30 minutes to install. According to reviewers, this touchscreen thermostat exceeds expectations with its beautiful appearance, easy installation, and convenient features. If you’re looking for a straightforward digital thermostat, you should consider the affordable Honeywell RTH6360D1002/E Programmable Thermostat. This model is a no-frills product that works with conventional two-stage heating systems. The Honeywell Thermostat has a 5-2 programming system with four periods per day, which means you can create different schedules for weekdays and the weekend. However, you can also choose to have all seven days the same. The thermostat also sends alerts when you need to change your air filters and when the batteries are low. Overall, this is a simple programmable digital thermostat, and reviewers say it’s easy to install and does its job well. Many people don’t like the idea of having a thermostat “watch” them, and if this sounds like you, you should look into a non-Wi-Fi product such as the LuxPRO Deluxe Programmable Thermostat. This straightforward model doesn’t connect to the internet, so it doesn’t have any complicated features and won’t collect data on you and your family. This thermostat has a 5-2 programming system, which allows separate weekday and weekend programming. There are four periods per day, and you can set different programs for heating and cooling. Additional, this product has a keyboard lockout in case your kids like to play with the buttons. Reviewers say it’s easy to install and program and works as advertised. There are numerous benefits to having a thermostat that connects to your home Wi-Fi network. For instance, products like the Honeywell 7-Day T5 Smart Programmable Thermostat can be programmed and controlled through a smartphone, allowing you to make adjustments from anywhere. This highly-rated product can be put on a seven-day schedule, or you can choose to enable location-based temperature control, which uses geo-fence technology to adjust the temperature based on your smartphone's location. It’s compatible with Amazon Alexa, Google Assistant, Cortana, and Apple HomeKit, and it automatically changes from heating to cooling to provide maximum comfort in your home. According to reviewers, the Honeywell T5 Smart Programmable Thermostat works great and is incredibly convenient. However, a few note that it’s fairly complicated to install and the associated app sometimes crashes. Those with single-stage heating need a compatible thermostat, such as the Emerson 5-1-1 Day Programmable Thermostat for Single-Stage Systems. This product is designed to work with single-stage heating, cooling, and non-aux heat pump systems. This thermostat has a unique 5-1-1 day program, which means you can set different schedules for the weekdays, Saturday, and Sunday. You can also choose to start with one of the pre-programmed schedules and simply tweak it to fit your lifestyle. Plus, the Emerson Programmable Thermostat has a filter change indicator, permanent memory backup, and a backlit LCD display. Reviewers say it’s simple and effective, and many note they would buy it again in a heartbeat. If you have a baseboard heating system in your home, you’ll need a special thermostat to control it. The Honeywell 5-2-Day Baseboard Programmable Thermostat is one of the top-rated options in this category thanks to its programming options. This product is compatible with electric baseboards, convectors, two-wire radiant ceilings, and fan-forced heaters. Its 5-2 day program allows you to have four periods per day, and it features silent switching for quiet operation — no more clicking! According to reviewers, these baseboard thermostats are easy to install and program, and they are quite accurate when it comes to controlling the temperature. Our writers spent 3 hours researching the most popular programmable thermostats on the market. Before making their final recommendations, they considered 20 different thermostats overall, screened options from 10 different brands and manufacturers, read over 50 user reviews (both positive and negative) and tested 1 of the thermostats themselves. All of this research adds up to recommendations you can trust.